Tom Yum Goong takes some getting used to. Those who don’t enjoy spice can stick to Thai stir-fries with seasoning added at the table, or Tom Kha Gai, a smooth, mellow flavored soup made from chicken and coconut milk. Tom Yum Goong, though, starts out spicy, with a salty, sour burn at the back of your throat as you swallow a mouthful. The flavor is intense, and since it’s usually served from a ceramic chafing dish that keeps it as hot as possible, the first bites of Tom Yum Goong make sweat bead up on my forehead and my nose run. At least, it should – once you’ve gotten used to the aggressive flavor of Tom Yum Goong it becomes addictive, and if it’s not spicy enough, it tastes insipid and salty. The spice is from boiled chili peppers, and a few spoon fulls of naam prik pao add a smokey depth. The sourness comes from lime juice, with the fragrant citrus taste from lemongrass and kaffir lime leaves. In market stands, these herbs are bundled together in an instant Tom Yum kit. Picking up one of these, I’ve had the stand’s proprietor then hand me all of the vegetables that they use in their favorite Tom Yum recipe. If the soup is soured with tamarind, the broth turns dark red, but I like Tom Yum without tamarind for its cleaner lime flavor. This soup is a surprising pale grey, with an orange film of oil from shrimp fat coating the top. Tom Yum means “boiled flavor mix,” and the word “yum” is used to name spicy Thai salads like Yum Ta Ley — Spicy seafood salad. Like these salads, a Tom Yum relies on the right flavor balance. Tom Yum is usually made with shrimp (goong), and the slight sweetness of shellfish balances to the intense flavor of the soup. Often the shrimp are shelled first, the shells used to make the seafood stock, and the meat boiled briefly at the end in the finished soup. This gives the soup a strong shrimp taste, while keeping the meat from being overcooked. Mixed seafood like squid, mussels, crab, or firm white fish are also an option. Boiled chicken fat makes the broth for Tom Yum Gai, made with chicken instead of seafood, richer and milder. 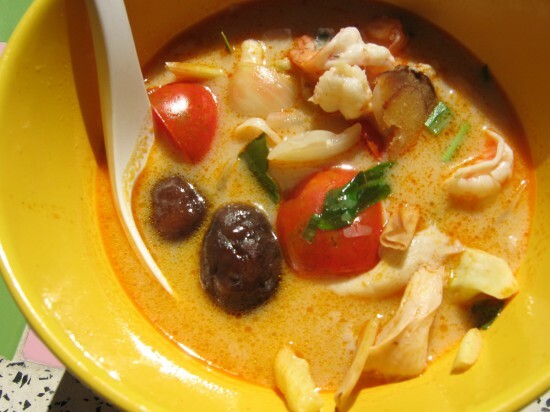 Tom Yum Naam Khon has a little coconut milk, or even cow’s milk, added to the soup, which dulls the flavor and tames the spice – this soup is usually made only with shrimp. 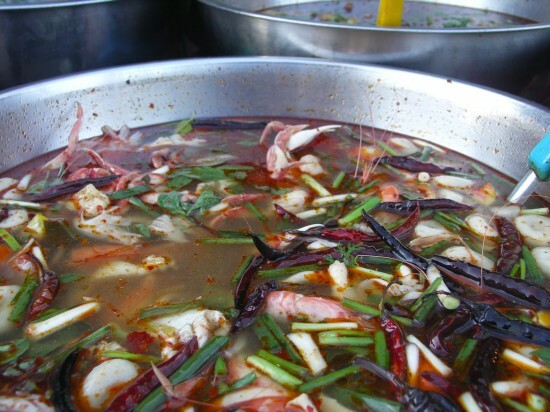 Vegetables like mushrooms, tomatoes, and fresh cilantro leaves are also cooked in Tom Yum, but the soup itself is mainly broth, with small amounts of meat, vegetables, and woody stems of lemongrass floating in thin liquid. Diners scoop their favorite ingredients from the dish full of soup into their individual bowls with a long ladle. People have strong opinions about their favorite variety of Tom Yum, and a little experimentation will quickly show you your own favorite meat and broth style. In Thailand, Tom Yum isn’t only for dinner. Dried ramen noodles come with an array of Tom Yum flavorings, and every 7-11 stocks a dozen different brands and varieties of Tom Yum noodle packs, such as Mama. Tom Yum flavored crackers, potato chips, and dried snacks like Tom Yum coated peanuts or dried fish, sit on grocery shelves. For an easy way to try Tom Yum at home, jarred Tom Yum pastes process the right herbs into a scoopable flavor concentrate that is an easy, and authentic-tasting, way to boil Tom Yum at home in a few minutes. Temple of Thai offers all of the key ingredients for authentic-tasting Tom Yum, like lemongrass, kaffir lime leaves, and naam prik pao. We’d love to hear about your experience cooking Tom Yum, or any questions you have, in the comments below.